Going into Joe Con 2016, I had some pretty strong ideas about what the souvenir sets were going to be. However, I was almost completely off base compared to what the GIJCC actually did. The one exclusive that I really didn’t have any idea how they were going to handle was the annual parachute drop figure. My best guess was that the GIJCC was going to do up another batch of the Sky Patrol set figures, equip them only with working parachutes and give them a toss. It wasn’t the most exciting idea out there, but it’s what made sense to me since the vintage figures were kind of defined by their working parachutes. Thankfully, though, that wasn’t the case and instead, the GIJCC added Freefall to the ranks of the Joe Con set and even better, unlike when I went in 2009, samples of the parachute figure were available for purchase at the club store the night of registration. That meant I didn’t have to worry about getting lucky and snagging one at the parachute drop or hoping that he wouldn’t sell out before I could get to the club store again. I’ve always liked Freefall and the GIJCC made a great choice in making him the parachute figure for the 2016 con. 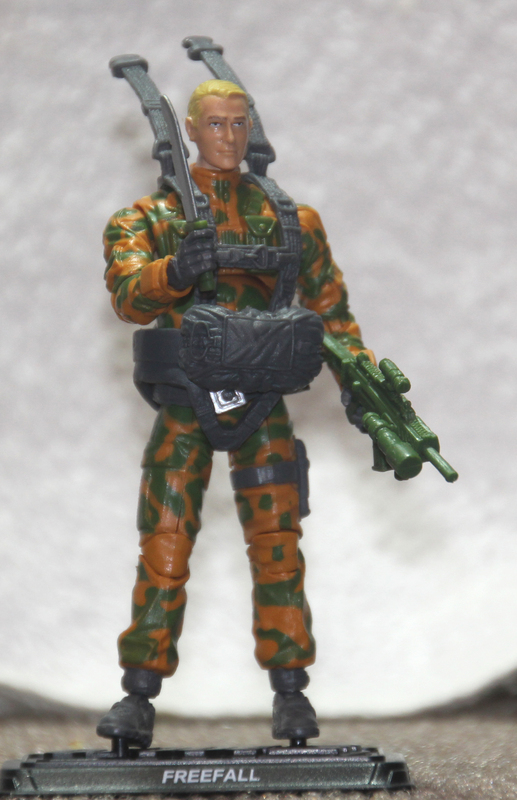 He has enough of a following that he moved quickly and he was originally released in 1990 along with the rest of the vintage Sky Patrol figures, but as 90s Joes go, he’s a little on the obscure side, so if you weren’t able to attend Joe Con, it didn’t leave a gaping hole in your collection. Considering how many paratroopers have been added to the Joe line in the last few years, I was a little unsure what parts Freefall was going to use. The GIJCC managed to find a decent combination of parts that we haven’t seen used a lot for paratroopers to make Freefall, so I think it works. He doesn’t have the flashiest design, but truthfully, the vintage figure was a pretty basic-looking soldier too, so it works. Freefall’s legs come from a somewhat unusual source, Pursuit of Cobra Desert Battle Snake Eyes I. Considering they were originally designed for an arctic figure, the baggy pants and short boots work quite well for Freefall’s basic BDU look. However, apparently somewhere along the line, the right foot picked up a bit of a twitch, because I can’t get that foot to work with the peg on the figure stand. It’s a little annoying, but at least Freefall is well-balanced enough that he can stand with just one foot pegged into the stand. Freefall’s torso comes from an old source, 25th Anniversary Snow Job, but you won’t really see it because Freefall comes with functional parachute rig that came with Retaliation Ultimate Flint. While the Snow Job torso is kind of dated, it being covered up helps hide the problems a lot of those early 25th Anniversary figures had and the details do fit in pretty well with the vintage Freefall torso. Freefall’s arms come from the Retaliation G.I. Joe Trooper. It’s not an obvious choice, but like the Snake Eyes legs, they do work quite well when paired with the rest of the figure’s parts and gear and are a decent stand in for Freefall’s basic BDUs. Topping off the figure, the GIJCC tapped 25th Anniversary Airborne’s head for duty as Freefall. I know there are a lot of people that are getting critical of the GIJCC using a lot of the same heads for various figures, but honestly, the Airborne head works pretty well for Freefall. I personally think Pursuit of Cobra Dusty’s head (another piece people feel the GIJCC is using to death) might have been a little better stand in for Freefall’s head, but since that piece was already being used for Airwave, I think using Airborne’s head was a decent way to go. It’s a relatively generic look and to be honest, Freefall was a fairly generic looking character. 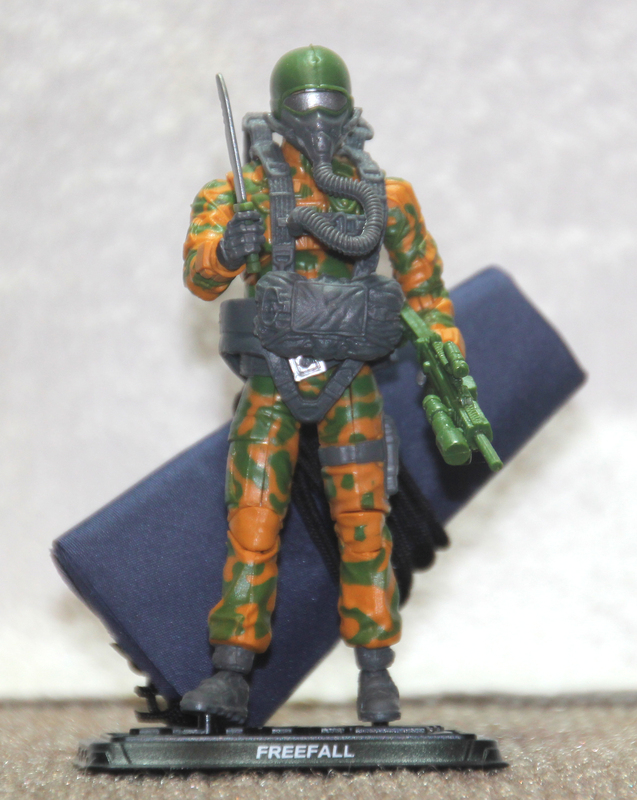 The GIJCC managed to create a great looking paratrooper without using any parts that were originally tooled up for paratroopers, and I have to admire their construction team’s choices here. At first glance, none of those parts seem ideal for a paratrooper, but they come together very well here and it’s nice to see a paratrooper that doesn’t extensively reuse Retaliation Data Viper or 25th Anniversary Ace parts. Freefall’s look was fairly basic, but the GIJCC did a great job recreating it on this modern version and while it’s rather simple, it’s still a solid look. The base of the figure is molded out of a medium tan and there are dark green camouflage blotches painted over it. Gray is used on the figure’s boots, gloves and straps. The colors are straight out of 1990 and Freefall looks very good in these colors. His helmet is dark green with silver for the visor and gray for the oxygen mask and tube. To be honest, I would have preferred to see the helmet in a lighter olive drab green because that’s what it was back in the day, but it’s a decent choice. Freefall has Caucasian skin and blonde hair, just like the vintage figure. It is kind of amazing how much the blonde hair changes Airborne’s look. Peering through his bag in the hotel the night I bought him, I really couldn’t even tell whose head it was. I knew it was a reused piece, but for the life of me, I couldn’t tell who it was. I think that’s why I don’t mind reusing the Airborne head for Freefall. We’ve seen it with a lot of different hair colors, but never blonde, so it looks like something new. 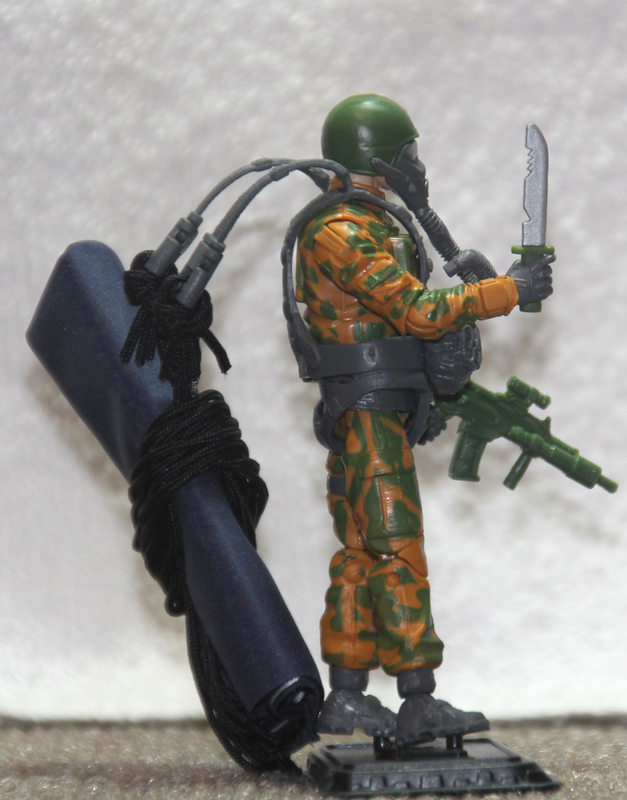 I’ve already mentioned the bulk of Freefall’s gear, mainly the Retaliation Ultimate Flint parachute rig and the 25th Anniversary Blowtorch helmet, but I haven’t talked about his weapons or the parachute itself yet. 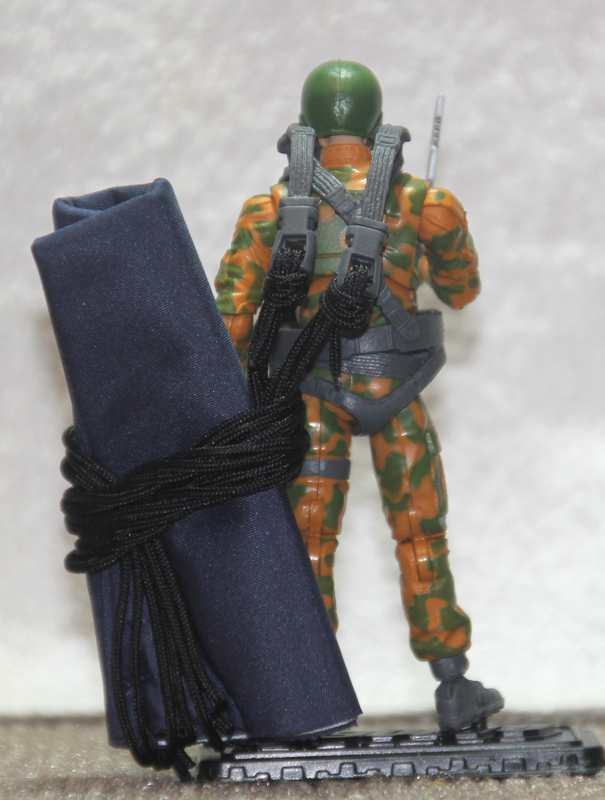 The parachute is made of blue cloth and has a Joe logo printed on it. I do think it was a bit of a missed opportunity to not put the Sky Patrol logo on it. Yes, Freefall wasn’t a member of Sky Patrol, but it would have been nice had the one functional parachute had the Sky Patrol logo on it like the vintage parachutes did. Freefall’s primary weapon is the Rise of Cobra PIT Commando assault rifle. It’s not unique like Freefall’s vintage rifle, but the design is great and it’s a nice piece for Freefall to have. Strangely, my bagged sample came with the side-mounted flashlight unattached. It fits securely, but it’s a little odd that it wasn’t attached at the factory. His other weapon is the large knife that first came with 25th Anniversary Falcon. 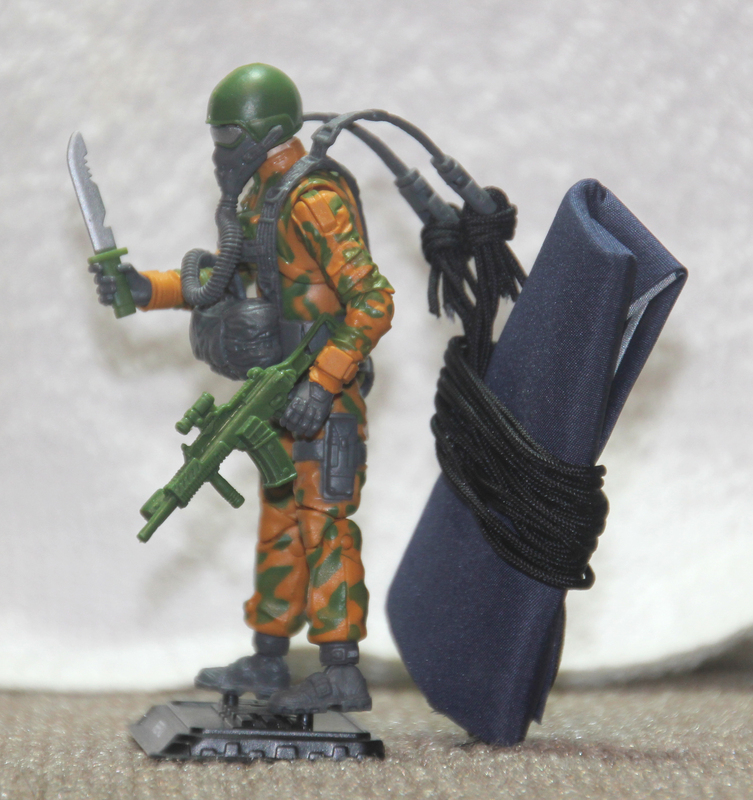 I like that a paratrooper has a knife, but I kind of wish he had a place to sheath it. I think Freefall would only want the knife out after he hit the ground. He’d want it safely tucked away in a sheath while he was dropping from the plane so he didn’t run the risk of cutting a line or the canopy. Regardless of that issue, though, the knife looks great in his hand and fits well with Freefall’s character. Much like the vintage figure, the great gear helps make Freefall a bit more interesting and that’s a big plus. I’ve been pretty lucky when it comes to Joe Con souvenirs. The years I haven’t been able to attend, the souvenirs have been things I’m largely uninterested in (though I would love to get my hands on a reasonably-priced Annihilator at some point). However, I know I would have been super bummed to have missed out on all of 2016’s souvenirs, but Freefall especially. Usually, I don’t find the parachute figure to be that interesting, but using that as a way to get Freefall out was a stroke of genius. The three figures from 1990 I have the strongest memories of are my Freefall and Bullhorn and KansasBrother’s Ambush. Now, over the course of two years of FSS releases and a con parachute figure, I have that trio again and I couldn’t be happier. I know a lot of people kind of consider Freefall a poor man’s Ripcord, but I never knew about Ripcord as a kid, so to me, Freefall was my team’s primary paratrooper. I understand why Hasbro focused so much on those early 80s Joes and I’ve really enjoyed getting to meet new-tome, older characters that weren’t on the pegs when I was a kid. At the same time, though, I’m really glad that these 90s Joes like Freefall are finally getting some attention from the GIJCC since there are quite a few fans my age that are now coming to the point where they have some disposable income that can be focused on Joes again. I’m glad to see that the GIJCC has started acknowledging that there are some good figures and good characters from this latter part of the line that deserve just as much attention. After all, Ripcord may have been someone a little older’s first Joe, but Freefall was probably someone’s first Joe too. While I still love that product that Hasbro is putting out (and they took some neat chances with 2016’s 50th Anniversary stuff), a lot of those 90s characters that definitely have a following aren’t getting any attention from Hasbro so I’m glad that the GIJCC is stepping up to fill the hole. I liked getting to meet Ripcord back in 2009 (though he did have to steal Freefall’s identity to get released), but having a modern Freefall in my collection is a great thing for me and I think there are a lot of Freefall fans out there that would agree with me. It’s funny the original Freefall was released the same year as Sky Patrol, but didn’t get released as part of the team.